safest, healthiest, most ecological, economical, durable, beautiful and artistic building material on the planet! We will begin a new cob art studio and build walls, put in windows, sculpt and mosaic on cob, pour a new floor, and plaster a finished wall and start a finish floor coat on another structure. We will also build a small foundation, put on a metal roof, address permitting, budget and timeline… and have some special guest speakers. 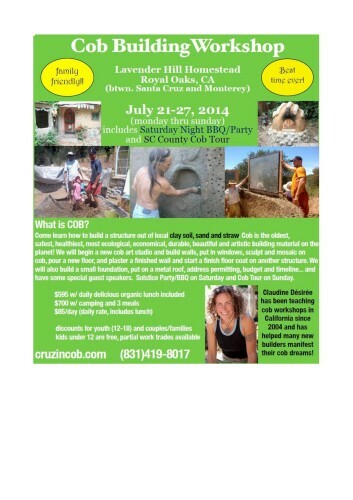 Saturday Night Party/BBQ on Saturday and Cob Tour on Sunday.